Fifth-year senior defensive tackle Patrick Gamble has been a leader on and off the field for the Tech football team the past two seasons. This year he was rewarded by being named one of Tech’s team captains, the only defensive player to earn that honor in 2016. Gamble wears No. 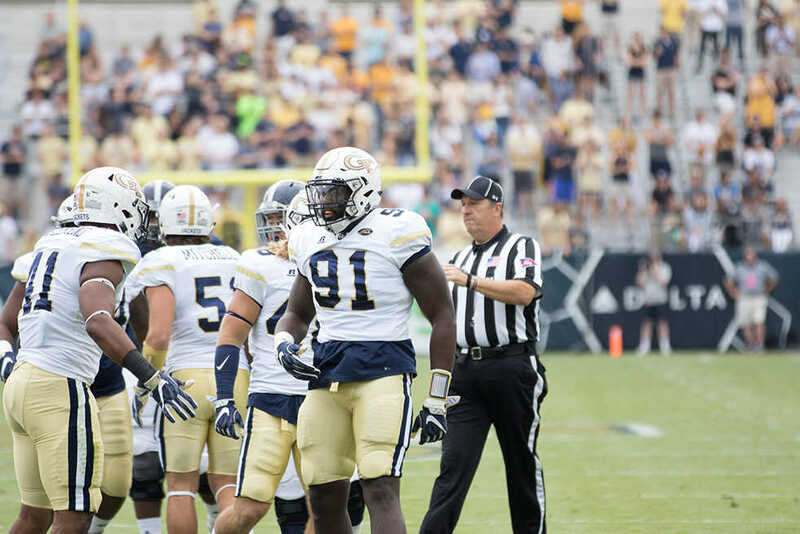 91 for the Jackets and has always been one of the more noticeable players on the field due to his 6-foot-5 frame. The Carrollton, Ga., native became a significant contributor during the last half of the 2014 football season. With Tech’s run defense struggling and lack of depth at the defensive end position, Gamble was moved to the defensive end position to help fill the gaps in the trenches. With that move, Tech’s defense became significantly better and he helped play major roles in stopping the run games of Georgia, Clemson and Mississippi State. Gamble is most remembered for being the player who blocked the Roberto Aguayo 56-yard field goal, setting up the return by junior corner Lance Austin to give Tech a 22-16 victory in last year’s homecoming game against FSU. The one-year anniversary for that play was this past Monday. Along with Austin, Gamble will go down in Tech football folklore, but he is hoping to add an impactful final statement to his Jackets legacy in his last year. Coming off the bye week, Gamble only has five guaranteed games in his career, and his goals and the team’s goals have been made very clear: to win out. Tech plays their annual homecoming game this Saturday at noon versus the Duke Blue Devils, a team that has knocked off the Jackets two seasons in the row. “A win over Duke would give us a lot of momentum and a lot of confidence. They’re a good ACC team and they’re in our division so we got to go get the win,” Gamble said of the contest. Tech’s defense is statistically better this season than in the past two years Gamble was a starter. The Jackets are 27th in total defense this season, compared to 42nd in 2015 and 81st in 2014. Tech is allowing 21.9 points per game which is good for 32nd nationally. That number is also much improved compared to 51st in 2015 and 53rd and 2014. However, those numbers don’t tell the full story. In 2014, Tech’s defense forced turnovers in key spots, flipping field position and sometimes putting points in the board or turning sure points by the other team into key defensive stands. Whether because of a younger secondary or a relatively weak pass rush, the Jackets have not measured up to those standards in the 2016 campaign. Gamble and the defense are hoping to reverse the trend as forcing turnovers are a very crucial part to winning football games. Gamble credited other teams since “they’re on scholarship too,” but the lack of turnovers has been very frustrating for Gamble, the defensive unit and coach Roof. Gamble hopes the team will display its best defensive performance of the year on Saturday. That may be the difference.